I spent the first half of day sixty-one winding my way through the Rocky Mountains. I reached the fruited plains at noon. I turned south heading for Colorado Springs. I wasn’t sure where the National Firemen’s Memorial was so I pulled into a Fire Station to get directions. It was like walking into my own kitchen. I was greeted by two young Firefighters who introduced themselves as Mike and Paul. A few minutes later another old retiree, named Jerry, walked in. Paul made a fresh pot of coffee and we talked fire talk. I was with my family once again. Mike told me an interesting story. He said prior to joining the Colorado Springs Department he had worked on the Antarctica Fire department. He said that the duty tours were for six months. The department was a contract department run by Raytheon Corporation. They can be found by going on line. A person must stand the $1600 dollar cost to fly to New Zealand. There you will do a short training stint but will be paid as soon as you sign on. Raytheon flies you to Antarctica where you become an active Firefighter. Mike said it was a fascinating experience. I spent about an hour and a half at Engine Six, got directions and said goodbye. I had enjoyed visiting my brothers. I promised to be back on September 11th for the annual memorial service. The park was only a few miles from the Engine House. It was a beautiful place. Looming in the distance I could see majestic Pike’s Peak. The blue sky accentuated the gleaming white snow on the mountain top. I was alone in the park. There were flags flying and a sculpture of a Firefighter rescuing a child. 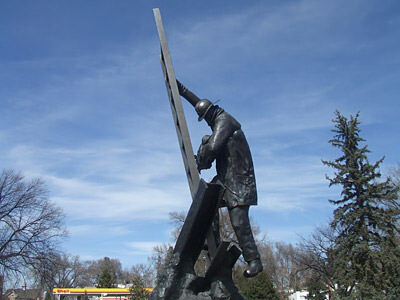 The artist had captured what fire fighting was all about. I approached the wall where my brothers now resided. 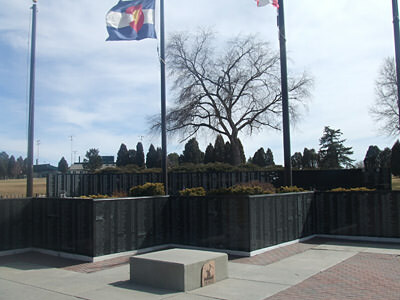 There was a second wall where the fire crews who perished on 911 in New York are memorialized. 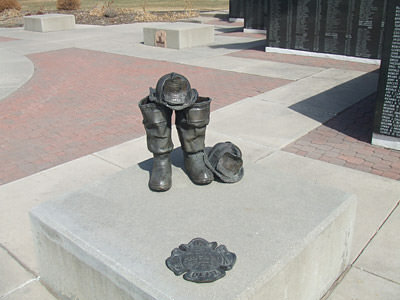 I saw a statue of an empty pair of boots and a helmet that the Chicago Firefighters Union, Local 2, had contributed. It was a bright sunny day and as I walked through the site I could sense the strength of spirit on this hallowed ground. 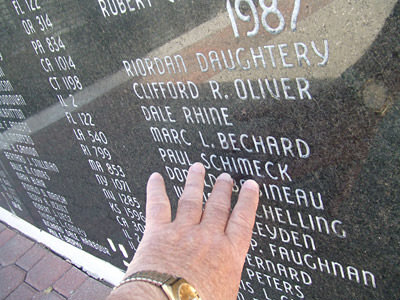 As I passed the New York 911 wall, I gently moved my hand across the names and thanked them for their sacrifice. I searched the front wall and found the names of my running mates. 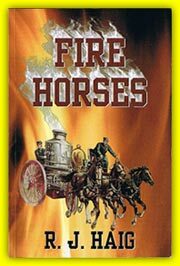 They were Paul Schimeck, David Lau, and Larry McDonald. I reached out and touched their names and it brought tears to my eyes. I sat for a while and talked to them. My heart was filled with pride for having known these men. I walked away knowing my entire road trip was worth the time I spent with the spirits of my fallen brothers. My friend Paul was a very special Firefighter. Chicago's contribution to the memorial site. What Firefighting is all about. New York lost the most on 911. The wall in the background belongs to them.